We’ve been writing a lot recently about what to STOP in 2017. Recruitment Marketing is next on my agenda to “trim”. There’s almost too much being done in recruitment marketing. Recruitment leaders are at risk of falling into the 50% wastage marketing model as described by our beloved John Wanamaker. 46% say you simply need more time! I often come across Recruitment Marketing departments who are disconnected from Sales – disconnected enough to warrant a (healthy) scepticism. This is often demonstrated by graphs showing community sizes rather than fees generated from marketing activities. Why is recruitment sales and marketing often disconnected? I find that this can be due to a complete lack of understanding (by Sales) of what Marketing is there for. Marketing are often not expected to generate leads, and if they do, Sales sometimes don’t stop cold calling long enough to convert them, or feedback to Marketing on improving the lead criteria. Who cares about your community? I want money! Tell them who your target clients are – seriously, they’ll love knowing and they’ll get super giddy when they see these clients surfing your website and engaging with their content. Put down the cold call and demand a list of warm calls. Stop jumping out of your cave with your club looking for the Woolly Mammoth and start looking to be stroked. Are you so busy chasing that you can’t see who’s looking at you? Get a lead from your marketing department and it’s not worth your time? Feedback and demand better (nicely). Recruitment marketers need to “get” Sales, generate leads, demonstrate value and get into the thick of growing a business. 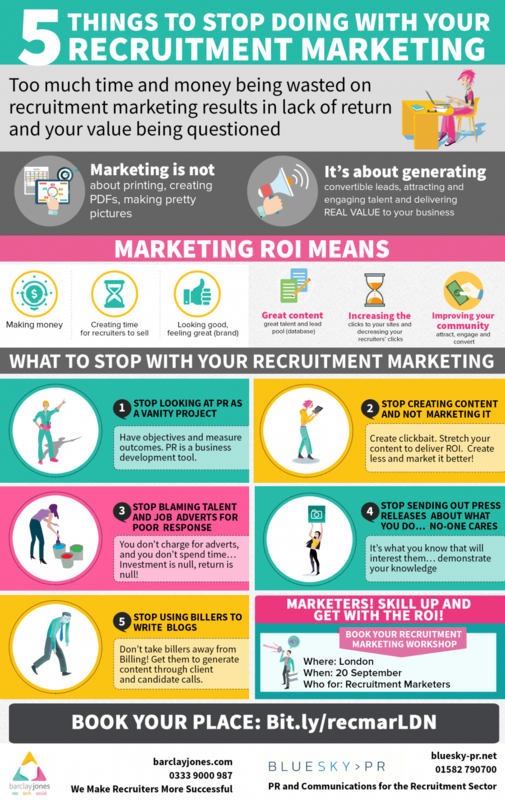 So, with my theme of What to Stop being key for recruitment leaders and marketers this year, here are 5 Things I think that you need to stop in 2017… oh and these will be key elements on my Recruitment Marketing Workshop with BlueSky in September in London. Pr… Content… Job Adverts… Press Releases… Recruiters writing blogs… plus lots more!